Why the Brazilian PR team is better than the Brazilian soccer team…. So, after finally deciding to put our careers on hold for 11 months, my wife Jane and I jetted out of Heathrow bound for Rio. We asked approximately 38 BA staff whether an upgrade was possible (and at one point it looked hopeful), but eventually took our seats in cattle class. The flight was inevitably delayed, but was pleasant enough, apart from BA’s decision to surround us with kids. They were pretty well-behaved actually, but when children are sitting in the aisle and throwing toys at your feet, you can’t help feeling like Jonny Wilkinson approaching a penalty under the posts. Thankfully we arrived without committing infanticide, to a balmy but rain-soaked Rio. It appears all taxi drivers here aspire to be the next Ayrton Senna – certainly ours from the airport got sideways a couple of times on wet, cobbled, incredibly steep streets, with tram tracks just to really test the (lack of) grip. After several tours round the neighbourhood, we located our home for our 6 days here after midnight, which is lovely, with English owners, although the “trust bar” is testing our moral fibre. Who takes an umbrella travelling? On our first morning, I awoke to find neither camera nor my eReader working and immediately blamed Jane. Well, she had put the camera in the hold, so I assumed it had frozen. 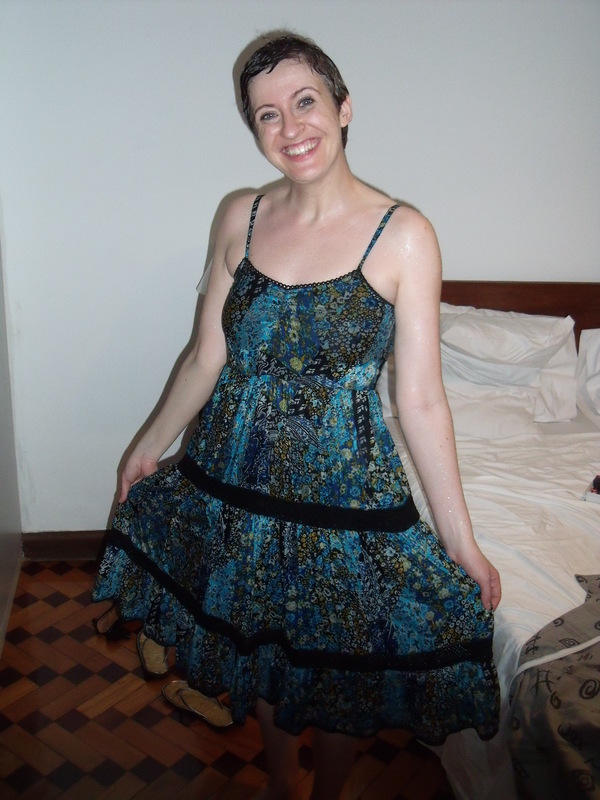 We left to explore downtown Rio, whereupon Jane maliciously jammed the key into the external door and broke the lock, leaving us stranded inside. The lock had to be replaced, although thankfully with no charge to us; the eReader needed lots of charging and somebody (clearly me) had put the battery in the wrong way round in the camera. These minor issues resolved, we spent our first day pottering in overcast downtown Rio, which had some lovely old buildings, although a little tired round the edges. We got the tram there and back, which was an experience in itself, especially over the 70ft high viaduct (which became even higher when I rode clinging to the outside of the tram the following day!). The first evening was spent locally with beers, huge steak/fish meals and caiparinhas (which unfortunately Jane doesn’t particularly like, so I chivalrously drank). We have since found out that all meals are generally meant for 2 people, so the first few meals were pretty large as we were ordering one each! For those of you who are fans of Schadenfreude, you’ll be pleased to hear that the whole evening was spent in monsoon-like rain, including the 15 minute walk up the steep hills back to the hotel, which we sloshed into like shipwrecked mariners! 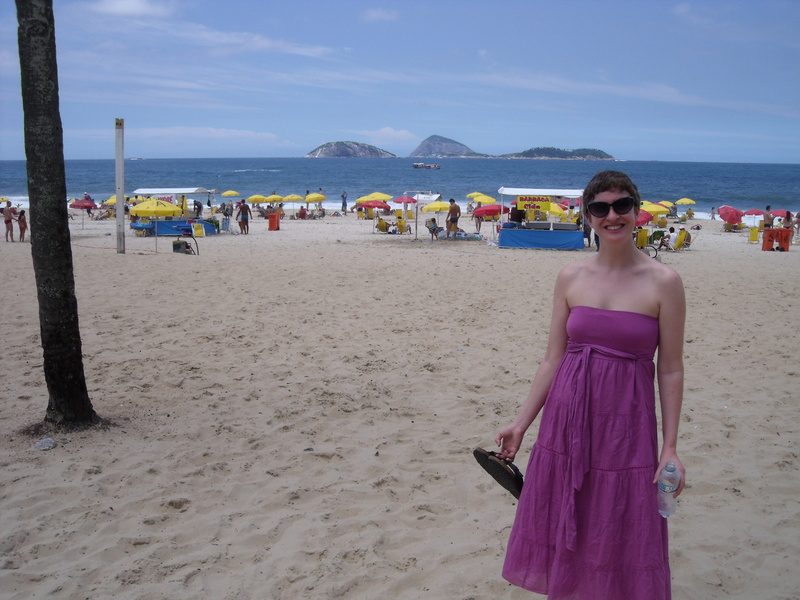 The following day we headed for some people watching on Ipanema and Copacabana beaches. We are convinced that Brazil’s PR department has hoodwinked us all – where are all the beautiful people? Even Jane and I wouldn’t have looked too ridiculous if it wasn’t for our alabaster complexions. We have discussed the lack of beauties at length and feel somewhat cheated that most of the women look like the back of a (large) bus (though this doesn’t stop them from donning beach apparel that wouldn’t cover a dormouse) and most of the men like they’ve escaped from an institute of some kind. Perhaps we’re seeing what we want to see to make ourselves feel better! Headed out to lively Lapa in the evening for some beers and samba – had a great time apart from the drug-addled 14-year-old scrote who tried to pick-pocket me – thankfully we have money stashed in so many places about our person, that even had he been successful, he wouldn’t even have been able to buy another hit. This secretion of our money, like squirrels with their nuts, will inevitably lead to us losing a fortune, having forgotten where it’s stashed (usually in Jane’s bra). We’d realised before we left the UK that there was a football match at the Maracana during our stay, so headed down there at lunch time to pick up some tickets from a ticket office where the window was somewhat smaller than an envelope and at crotch height (not ideal when you don’t speak the lingo and sign language is your modus operandi!). 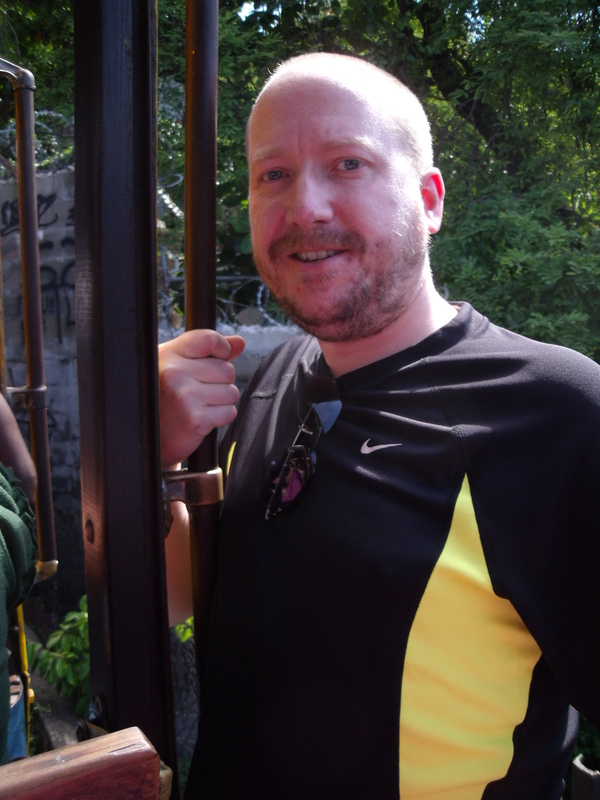 However, we got the tickets and after we realised that the place we wanted to head to prior to the game was quite close to a favela (scary shanty town with guns etc.! ), decided to head back to the hotel to await kick-off. 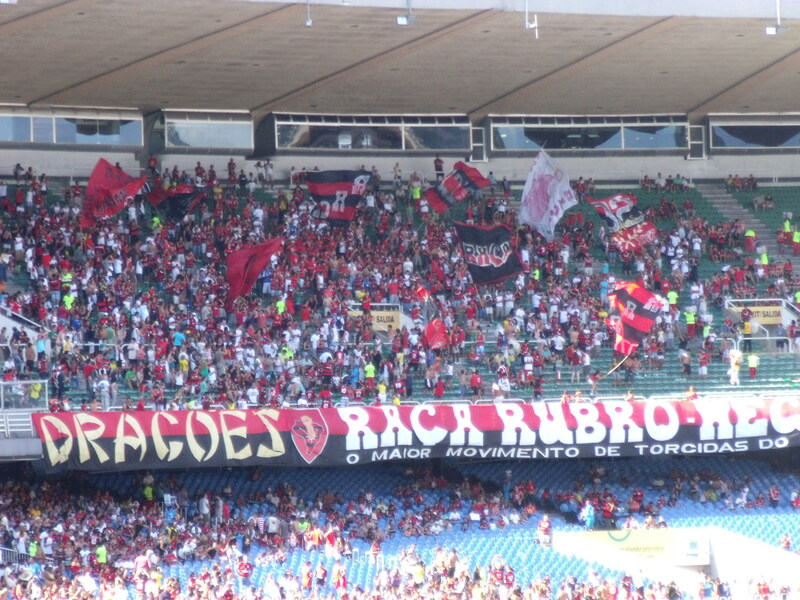 The game didn’t disappoint – 5 goals, a sending off and a home win for my newly adopted Brazilian team, Flamengo. The atmosphere was phenomenal in spite of the Maracana being only about 1/5th full. 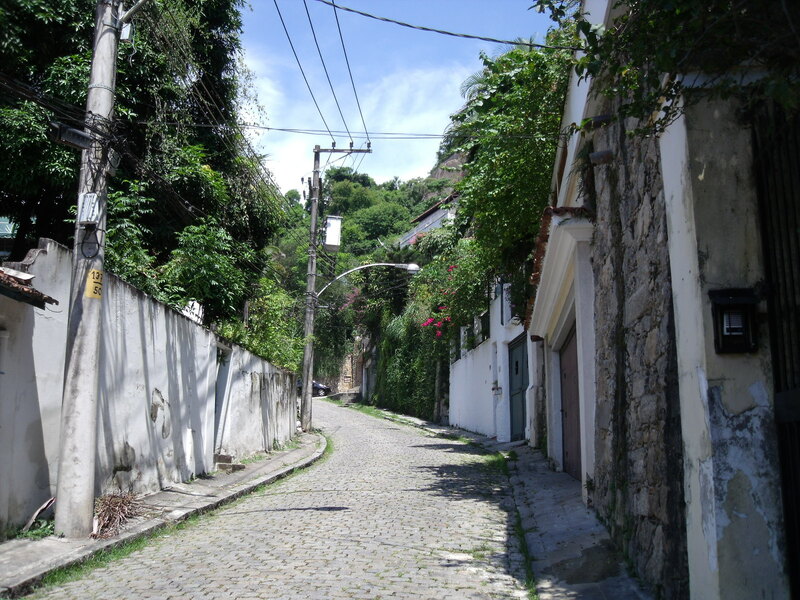 During our last couple of days in Rio, we did “the sights”. Getting to Corcovado proved a bit of a trial after we rejected the taxi driver´s fixed price (which turned out to be very reasonable). When we returned with our tails between our legs, they simply ignored us, so our circuitous route took us into downtown on the bus, in order to get another bus, followed by a cog train to the summit. It was worth it. 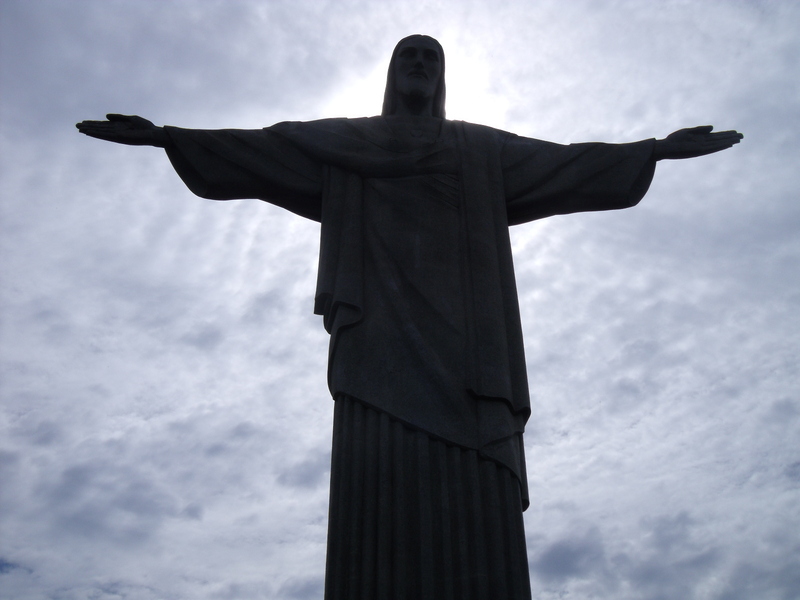 The views were spectacular, even though it was a little hazy, and the statue of Christ the Redeemer was very impressive. 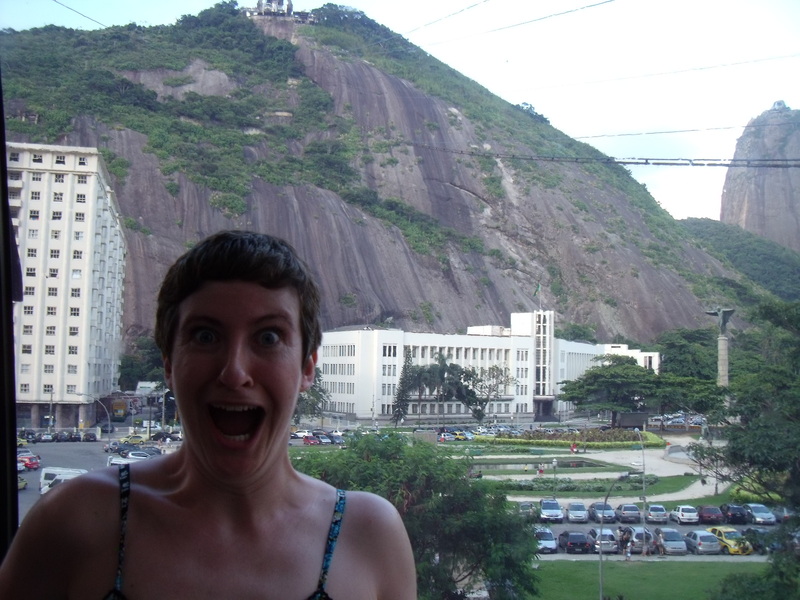 The following day (our last in Rio), we went up to Sugarloaf mountain in the hope of seeing the sunset from up there. The incredibly smooth system of fast cable cars (to Jane´s relief) saw us at the top within ten minutes and again looking down on Rio from an incredible vantage point. 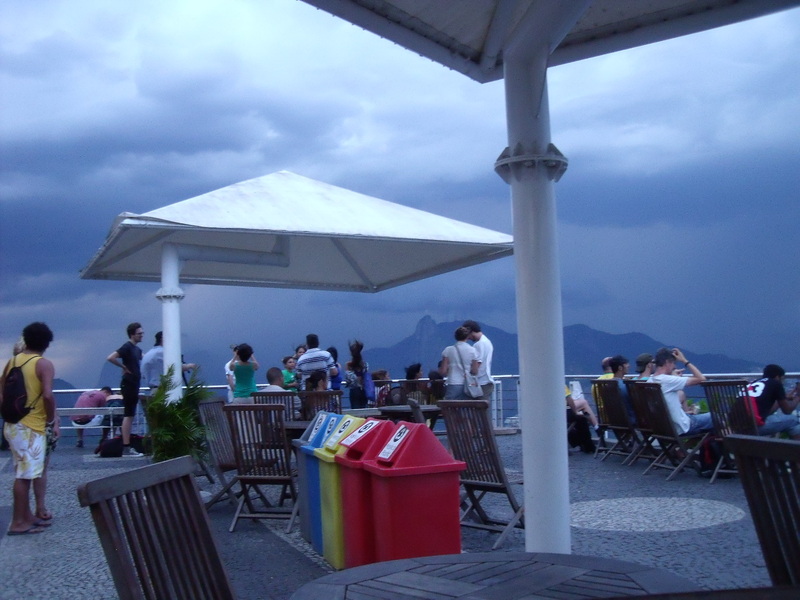 However, instead of seeing the sunset we´d envisaged, the skies suddenly darkened and the wind picked up. Within 15 minutes, the cable cars had stopped running due to the wind, it was pitch black and we were at the top of the highest point for miles around in the middle of a fearsome electrical storm. Of course we loved it! The lightning seemed to be only feet away at times and the wind was incredible – had I launched Jane over the edge I suspect she would have made it to Venezuela, but she didn´t seem keen. After an hour the storm abated, but it was quite some experience! When we got back to the pousada, the whole area was blacked out, so all the restaurants were closed. Our final meal in Rio turned out to be a handful of peanuts each. The storm obviously stirred something in the local hounds, because that last night was like sleeping in a cage at Battersea Dogs´ Home during a barking contest. So that’s us so far – we’re really loving it and the weather for the most part has been kind. A steak the size of a large dinner plate. Fabulous shrimp moqueca (spicy coconut stew, a bit like Laksa).